I'm adopting a GSD puppy and I hope to train him with positive reinforcement which will include for a while a treat as a reward. What are the best treats to use without packing the pounds on the little fellow? I don't want it to be something that has to be cooked or something that has a short shelf life. Below are a few suggestions for training treats that you may want to try. No matter what you use however, I would suggest you break it up into tiny, tiny pieces so that the treat goes longer during the training sessions and so that you're not giving them a great big piece of something each time you treat them. Also, if you can find something really aromatic, maybe liver based or something, the dogs love it even better even though you might not. Biggest thing of all to remember - keep in mind how many treats you're giving and subtract those from meal time otherwise you'll end up having a tubby GSD puppy. 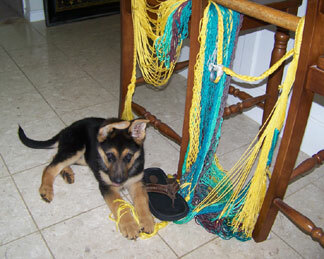 Good luck training your German Shepherd puppy! Comments for What are the best treats to use in training my German Shepherd? I use Zukes. They are great, and even though the mini naturals smell terrible, my pup LOVES them. I also mix in some Zuke Z- Fillets cut up into smaller chunks. I can even cut the mini naturals in half because my pup is a thourgh chewer and takes FOREVER to eat one treat. Zukes are also all natural with no artificial colors, wheat, and icky stuff like that... I jope this helps!! Sometimes you need to have a plan a b and even c with gsds. I have a dog who would not take any treats from me. I tried everything in the pet aisle. Even dried liver chunks. I could not train because I had nothing to motivate her with. But then I tried fresh cooked beef liver chunks. She loves them, and they are cheap (nearly a fifth of the price of dehydrated liver). The great thing about liver is it is very low calorie/low fat treat. I just boil it. If you don't want that try small pieces of hot dogs. The police force trains their dogs with hot dogs. They work good, just higher calories.